If people were not sure of buying and selling and managing the cryptocurrency portfolios, they decided to invest in another form into the disrupting technology they decided to learn and invest in the Blockchain Technology. A Blockchain is a decentralized database that carries the potential for being used in applications for maintaining financial ledgers. By definition, Blockchain is a real-time ledger that can maintain transactions of anything that is recordable like physical assets, financial transactions, contracts, supply chain information, and more. There is a lack of a central authority keeping track of the records, which makes the process transparent, as all the users in a chain can view the details of each record. The terms Smart Contracts fell upon our ears for the first time last year. They are essentially a consequence of the release of the Ethereum Project in 2013, that gained popularity only recently. Ethereum is a platform that can run Smart Contracts- the applications that run exactly as they are programmed to, without the slightest possibility of a downtime, fraud, censorship, or third-party interference. Smart Contracts enable developers to store and manage registries of debts and promises, make movements in the funds according to a futures contract or a will that was written way back in the past, create markets, and other use cases that have not yet been invented. According to Antonis Polemitis, CEO, University of Nicosia, and a pioneer in Blockchain Technology and Cryptocurrency education, the Blockchain industry will be, over several decades, as revolutionary as the birth of the Internet was. He expects there will be several millions of people working in the Blockchain and offshore software development Industry, if not tens of millions. Antonis also predicted that there will be an increasing demand for professionals like lawyers, auditors, accountants, and government regulators, who know the technology and its nitty-gritty. Gartner's Blockchain trend insights report that was released this year, suggests that Bitcoin is only one tiny application of the Blockchain technology. The report stated that the technology has far and wide applications in areas like- healthcare, education, government, manufacturing, supply chain, automotive, and energy. The report also added that by the year 2030 the technology will add a value of $3.1 trillion to businesses globally. Last year, J.P. Morgan Chase and Company revealed that it launched a new payment system that uses the Blockchain Technology. The project was undertaken in partnership with Royal Bank of Canada and Australia and New Zealand Banking Group. A statement from the company said that the new Interbank Information Network is to provide quicker payments to beneficiaries with better security. British Petroleum innovated with Blockchain to enhance the efficiency of oil and gas trading in a move to join corporations trying to bring the database technology into commercial mainstream usage. The credit giant Mastercard innovated with Blockchain by unveiling a set of payment tools based on the technology and opening them up for wider use by banks and merchants. The Singapore Central Bank revealed 3 new Blockchain Payment Prorotypes last year forming the second phase of the initiative that started in 2016 to test- the creation of a tokenized version of the Singaporean dollar- Project Ubin. With these advancements in mind, it is much clear to see that Blockchain is Beyond the Buzz, it is something that lurked from behind the bushes for a while, but is now engulfing it with speed and force. 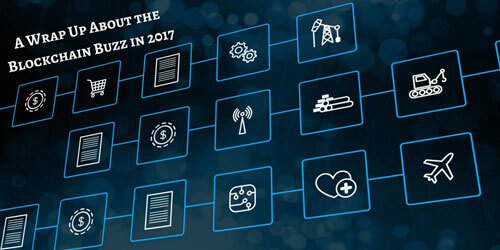 Are you ready for the Blockchain Buzz to fade and things to get real in 2018?